How do you find a local church to attend when on holiday? Well John googled ‘evangelical churches in Hikkaduwa’ and could only find one – Calvary Free Church. According to one unoffical FB page we could see the location of the church on the map but no reference to service times or what language the service would be in etc. All we could find was a few news articles about the occasions when the church had been attacked by a mob whipped up by Buddhist Monks. One news story said that the attack happened at about 10am, so we left the girls at the hotel (since we didn’t know when the service started or if it would be in English they weren’t keen) and went off to investigate. After wandering up and down the street (listed on the map) for a bit we asked someone who eventually pointed us to a building right next to the railway line – you can’t hear much when a train goes past! We’ve no idea how long the service had been going for when we arrived but we still got another 2 hours + worth. It was such a fantastic service. Since he spotted some western visitors the Pastor translated bits of what was going on into English for our benefit. There must have been about 100 people, including children – the place was packed… Which meant, despite the fans, a lot of sweating for the two white people. My guess was that everyone there was Singhalese. Although the age spread was good women outnumbered men about 2 to 1 – very similar to the rest of the world. One young man spoke to us after the service to tell us that he grew up in a Buddhist family and became a surfer – that lifestyle led him to alcohol addiction but coming to faith in Jesus had turned his life around. The aspects of the service which we were there for included – lots of singing (‘stutti’ = thank you, is one of the few sinhala words I know so we could tell that they were very grateful people); just like in HBC they had to learn a memory verse from last week and lots of people recited it from their seats to everyone; lots of prayer – on topic was introduced at a time and then we all prayed out loud … Topics included world events, racial reconciliation in South Africa, that aid for the recent floods would reach those who need it and not be siphoned off, for the Sri Lankan government, for the local Galle district of churches, for the judges’ statement tomorrow (Monday) to do with their case of harassment by the Buddhist Monks that has been on-going since 2002; there was a chance for anyone to come and share – but no one did … All a bit shy, just like at RLBC 🙂 ; Bible reading and sermon; children taught us a song; communion; offering; final prayer. The sermon was on Romans 8: 28 (the memory verse for this week) and included references to the attacks on the church – Pastor Ranjan said that even if they were to come and burn the church down God has promised that he will use that to his purposes – making us all more like Christ. After the service Pastor Ranjan Perumal told us a little about the recent history of the church. Over the past 15 years the church has suffered several attacks. The latest one was on January 12th 2014. The local Buddhist Monks claim, wrongly, that Calvary Free Church and the AOG church are not registered and should be closed down. They invited the media to come and report when they confronted the churches. However, their plan backfired when the media filmed Monks kicking down the doors within the church and setting fire to files and Christian literature. The Christians did not retaliate and the media reports went viral as the rest of the country and the rest of the world saw the way Christians were being treated. This has highlighted the plight of religious minorities in Sri Lanka – about the same time some Mosques in Dehiwala were also attacked. Supposedly the constitution protects freedom of religion but in reality Buddhism holds sway in the government. The court case referred to earlier is about a previous attack in 2002 when the same Buddhist Monk physically attacked one of the female church members as part of another attack on the church. This case has been dragging on all these years as the legal system tries to ‘bury it’. However, the media coverage of the attack in 2014 looks as if the magistrate will eventually have to do something. Please pray for the statement that will be made tomorrow (Monday) – may it protect the freedom of religion. 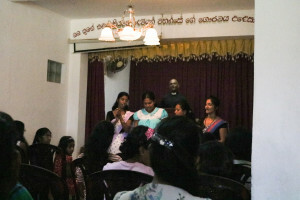 According to Pastor Ranjan one of the spiritual turning points for the church was the aftermath of the Tsunami. The local people know how much aid came from specifically Christian sources and how much the church did to rebuild the town. Pastor Ranjan made it clear that no pressure was put on anyone to convert to Christianity. They simply rolled up their sleeves and helped their (mostly) Buddhist neighbours. So this was not evangelism through the dollar. And yet, when people saw how the church showed the love of Christ more and more people wanted to find out more about this Jesus who motivated such love. 1. Welcoming different cultures – even though it was a mono-cultural church CFC has welcoming outsiders as a priority (translating aspects to make us feel welcome). One book I’ve been reading suggests a habit of singing the chorus to one song each week in several languages – as a (realistic) way of making people who do not have English as a first language feel welcome. 2. View of the government – CFC seem to have a very healthy view of human government. They were very supportive of the Sri Lankan government and encouraged people to pray for them reguarly. However, they weren’t intimidated by them either. In the prayers there was such confidence in the sovereignty of God no matter what others do. In the UK most Christians seem to either be opposed to the government or think that the future of the church is dependent on political solutions. 3. Evangelism vs. Social Action – as with CC in Colombo the church has grown here as they have first shown compassion in action and then been bold in proclaiming the gospel. This was not an either/or thing but both/and. 4. Expository preaching – almost all churches we visit here only have a diet of topical preaching. The sermons are all encouraging but I do wonder how much people are learning to read and understand the Bible for themselves. Update – just had an email from Pastor Ranjan: the Monk got a 12 year suspended sentence – an amazing answer to prayer because it sends a clear message about the freedom of religion in Sri Lanka. Praise God!